Rhode Island has one of the worst rates of population growth in the country: between 2010 and 2018, Rhode Island was 46th in the nation with only a 0.42 percent increase in population. Massachusetts on the other hand saw a 5.41 percent increase, while other New England states, Vermont and Connecticut, were two of the four states with slower growth than Rhode Island. This is in part due to a nation-wide trend of fast population growth in the Southwest of the US, but many also blame the so-called “brain drain”: college students fleeing to other states after they graduate. Travis Escobar, a Rhode Island native who works on policy for United Way RI and was recently appointed to the Providence School Board, helped found an organization—“Millennial RI”— to tackle this drain. “Our population is old,” Escobar told the Indy, “We are constantly losing young people.” Escobar is backed up by numerous sources, from Providence Monthly to the Providence Journal, decrying the flight of young people. In fact, one recent study from the Brookings Institution found that Providence keeps only 36.5% of its college graduates in the state, the second lowest rate of any metropolitan area in the nation. But whether Rhode Island actually suffers from this problem is far from certain, said Rhode Island College Professor Mikaila Arthur, who studied the trajectories of the school’s graduates. Arthur told the Indy that “it’s totally not founded,” to assume that college graduates are fleeing the state more so than they are other regions. Instead, Rhode Island’s small size and high number of students from out-of-state mean that “the issue is not that students are leaving Rhode Island, it’s that many are not from here and never intended to stay here,” Arthur told the Indy. So, while the idea of fleeing grads has perhaps been over-hyped, the need for attracting a young and educated workforce to Rhode Island to combat the consequences of an aging and stagnant population remains. As Arthur’s report makes clear, beyond just losing half our congressional representation, Rhode Island’s ability to recruit educated workers puts the state’s prosperity at stake. For this reason, both the Governor’s free community college initiative and groups like Millennial RI are trying, in their own distinct ways, to plug the proverbial drain. “We kept seeing negative articles about millenials and the brain drain,” Escobar said. When the Providence Journal published a piece entitled “Middle Class Squeeze: Millennials seeking jobs find better prospects outside RI,” Escobar and other young professionals felt moved to action. After proposing the idea of a millennial professional group in a Providence Journal op-ed, and calling for those interested to get on board, Millennial RI is entering its fifth year of recruiting and representing the interests of the oft-mocked generation. While it is an easy problem to laugh about, there is little doubt that attracting millenials is an important policy objective for most mayors and governors nationwide. As a result, especially before census years, local governments have tried all sorts of measures to keep their populations in-state. Recently ousted Massachusetts representative Mike Capuano, for example, once told WBUR that increasing air conditioner use in the state “would keep our population in Massachusetts.” Other towns, such as one in Iowa and one in Nebraska—in a kind of twenty-first century reiteration of the Homestead Act—will give free parcels of land to anyone willing to move there and build a home. Here in Rhode Island, Governor Gina Raimondo is trying her best to do the same, with two policies specific to helping recent graduates stay in Rhode Island. One of them, the “Ocean State Grad Grant,” pays up to $7,000 of recent college graduates down payments on their first homes. And the other, the “Wavemaker Fellowship,” gives a refundable tax credit of up to $6,000 a year for graduates working STEM jobs to cover their student loans. 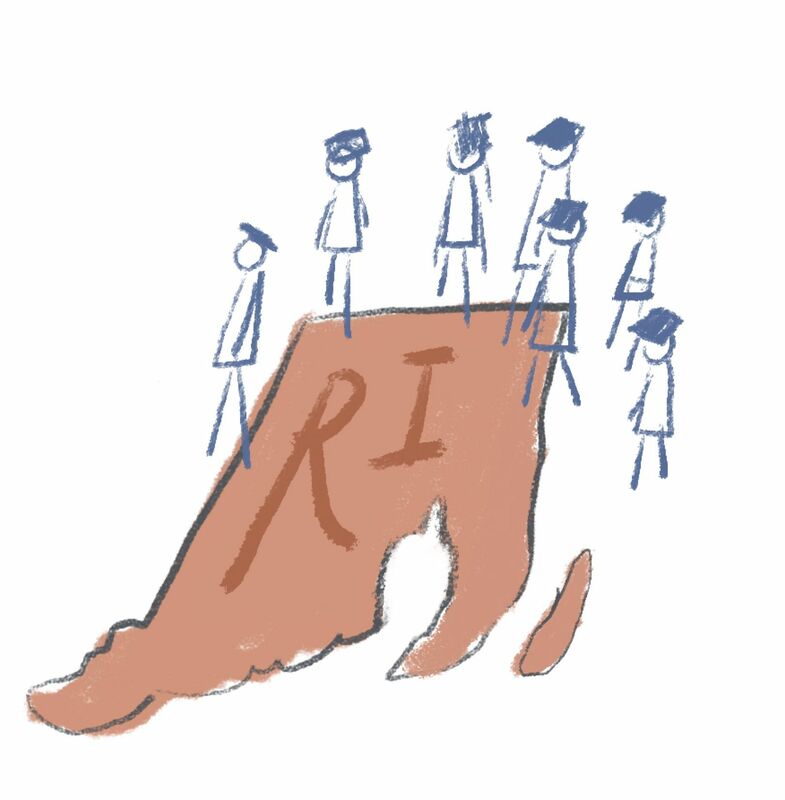 These policies, by explicitly targeting those already educated—those who might attend a Millennial RI networking event—could miss the broader problems specific to Rhode Island. To Professor Arthur, the fundamental issue is that Rhode Islanders are not graduating in the first place. “The reality is people are struggling to get through college—it’s because they have trouble getting degrees in the first place. They don’t have the resources they need.” The Governor’s recently launched initiative to offer free tuition at the Community College of Rhode Island will help address this, Arthur told the Indy, and should be expanded to include Rhode Island College as well. As her research found, “more than two-thirds of students graduating from Rhode Island College are still in Rhode Island a year after graduation, and the majority either stay in Rhode Island for their entire careers or leave for a time and return.” And perhaps most importantly, the Rhode Island Promise gives Rhode Islanders “that feeling that the state has invested in them and cares about their future,” thus reinforcing their desire to stay, Arthur told Indy. These kinds of statistics show that as much as people love to envision a constant exodus of millennials, many Rhode Islanders educated in-state do, in fact, stick around. Still, both Arthur and Escobar reinforced that the inclination to disparage Rhode Island—jokingly or otherwise—is strongest among those born in-state. “There are a lot of people here who just have not seen what Rhode Island can offer compared to other places,” Arthur said, while she and other transplants usually just think, “How did I get lucky enough to live here?” It is perhaps for this reason that just this past Wednesday, CNN Travel published an article, “Is Providence the USA’s Most Underrated City?” Escobar and Arthur would probably say yes. HARRY AUGUST B ’19 might just, in fact, #ChooseRI.